This is the ultra-luxe villa dreams are made of, created by a world-famous designer to provide the ultimate holiday experience. Villa Haven is wonderfully located and beautifully furnished, with a stunning interior and each bedroom like a private suite in a five-star hotel. Of course, there’s a private pool complete with romantic outdoor sala for lounging. The teak-plank terrace opens our directly to an elevated “private beach” with sun loungers and a huge expanse of ocean. The yacht owners can anchor off shore in front of the villa. There’s also a formal outdoor dining area with sea views. The living area features a fully equipped bar, massive dining table and 2 lounge areas. Every detail has been carefully considered, and is certain to delight even the most discerning travellers. Upon entering the downstairs you will be taken aback by its size and the two sides which are complete glass allowing easy access to the beautiful outside areas. This huge living space is home to a wonderfully carved dining table which seats 12. Two long, classic wooden dressers separate this space from the two lounges. One has a luxurious leather sofas facing the sea and a huge flat screen television, while the other is a more intimate conversation area near the fully equipped bar. To reach the fully fitted kitchen you go down a few steps and here you have an island for food preparation and coffee. There is also an oval open air relaxing area with stone benches either side of the central water feature. There is an exclusive “cards” room for intimate dining with gorgeous panelling and a crystal chandelier that begs to be enjoyed with that 18-year single malt you’ve been saving. Each of the 6 bedrooms is furnished individually with no expense spared, and whichever bedroom you see first is the one you’ll claim. Two of the bedrooms are private poolside suites, and the other four are inside the main house. All feature easy access to sea view terraces and balconies, stunning ensuite bathrooms, hand-selected furnishings, safes, and even mini-fridges. The master suite on the topmost level has the best views, though. The café-style seating is the perfect perch from which to appreciate the ocean breeze and views of the small island of Koh Lan in the distance as you relax overlooking the pool area. Words and pictures alone cannot describe the wonderful attention to detail the owner has shown in completing this residence, and the fact he is offering it as a holiday retreat is something those who take advantage of will never forget. This area is past Jomtien beach and is home to the most exclusive properties in the area. The atmosphere is quiet and relaxed, and yet you are only 5 minutes drive from Jomtien itself. Here you will find spas, restaurants to suit all tastes and relaxed nightlife. In the opposite direction you can reach such places as Silverlake Vineyard and Nong Nooch Gardens in around 20 minutes. The area is a rare gem – great privacy and seclusion, but with everything you want close at hand. 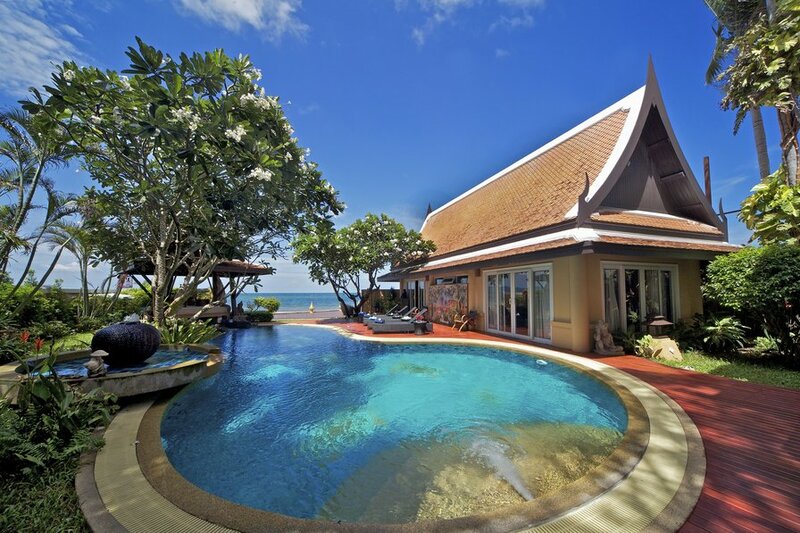 Click here to browse more villas for rent in Pattaya. All 6 bedrooms are en-suite and individually themed. Two examples are Japanese and Old-classic European. Each one is worthy of a magazine feature, with intricate lamps, ornaments, and decorations plus air-conditioning and televisions. Total comfort is yours throughout your stay. The master bedroom is right at the top of this imposing residence. Your seating area and writing desk offering unforgettable views, and there’s access to the private balcony with an additional seating area. There are 7 bathrooms, 6 of which are en-suite with your bedrooms while the other is beside the bar area in the lounge for guests. The fittings are all first class and the sky-light ceilings provide additional natural light. The rain showers are part glassed in and the tiled decor in each is excellent. Your kitchen is fully fitted with a tiled floor and walls; there is a black granite island with 4 breakfast stools and all the appliances you need if you wish to self cater. There is even a television here in case you need some inspiration from one of the international cooking programmes which regularly show via satellite. You will be hard pressed to find a more spacious and well designed living room. 2 lounge areas with separate sofas, arm-chairs and coffee tables as well as 1 huge flat screen TV complement the purpose built bar with glass mirrors and shelves as well as bar stools for your relaxation.